They can have their bread and eat it, too, using suggested substitutions and other tricks from our GF cookbook authors and experts. Whether at a fast-food eatery, chain restaurant, or mom-and-pop bistro, eating out today isn’t without its pitfalls, as any dieter can attest. Discerning the healthfulness of one restaurant’s roast chicken sandwich vs. chicken and walnut salad can be challenging. Fats hide in dressings, nuts, and cooking oils, and breads can house the majority of a meal’s calories. The circumstances get even stickier for people with celiac disease or gluten sensitivity, who are forced to pare down their menu selections even further just to steer clear of sickness. “The biggest challenge to eating out is to find restaurants that can serve safe, uncontaminated gluten-free [GF] food,” says Annalise Roberts, who has written several GF cookbooks, including Gluten-Free Baking Classics and The Gluten-Free Good Health Cookbook. But beyond safety concerns, she says the real key to eating a healthful GF diet is in not replacing processed foods of refined wheat and sugar with GF processed foods. “Overall, both those who [have] celiac disease and those who [do] not often are running around and trying to make the best choices they can that fit within the confines of their schedules and budgets,” says Marlisa Brown, MS, RD, CDE, CDN, author of Gluten-Free, Hassle-Free and Easy, Gluten-Free. “The biggest concern for those with celiac disease is trying to have foods that are safe from cross-contamination or hidden ingredients. You can’t just look at a menu or buffet and tell what is safe to eat,” she says of the intricacies of eating out for those with gluten sensitivities. For clients with celiac disease, eating in instead (and cooking for oneself) might seem like an easy solution most days of the week, if not for families’ packed-to-the-brim schedules, squeezed budgets, and overall lack of Top Chef cooking skills. Yet learning to put together GF meals at home is worth the time and effort invested, say experts. Here, a sampling of GF cookbook authors and experts offer their thoughts on the importance of home cooking and their best tips and tricks for making meals nutritious, delicious, and safe for the celiac set. “Additionally, home baking allows people living gluten free to have control over their fat and fiber intake, since lack of fiber can often be problematic for people on a gluten-free diet,” says Beth Hillson, a professional GF chef, cookbook author, and founder of Gluten-Free Pantry. Add money savings to that list, as Jennifer Cafferty, a GF culinary instructor and founder of The Gluten & Allergen Free Expo, explains that GF prepared foods often cost more than their standard counterparts (if they’re even available at the local store). “Those on restricted diets, especially a gluten-free diet, most likely cannot afford to buy all of their food already prepared,” she says, noting that for GF-ers, not cooking/baking at home can lead to quickly skyrocketing food costs. Fenster and other experts note that many people in today’s society were never taught cooking and/or baking skills when they were growing up and thus don’t have even a basic skill set on which to fall back—not to mention the intimidation that GF cooking presents. “Even if they had a limited exposure to cooking as a child, having to relearn the process with a completely different set of ingredients can be daunting,” she says. Indeed, if clients put in the necessary time to solidify some basic GF skills, a sky of possibilities could open up. “If you learn how to cook GF and do so regularly, you are only limited by your imagination,” says Brown. Whether a client’s fancy is for quick and easy one night, gourmet another, and budget-friendly the next, “On a GF diet, if you cook at home, you can virtually find a way to replace almost all of your favorite foods,” she says. “For those diagnosed with celiac disease, the simple act of eating can become stressful,” notes Kimberly Mayone, coauthor with Kitty Broihier, MS, RD, of Everyday Gluten-Free Slow Cooking. But she says learning just a handful of safe go-to recipes can make all the difference in the world to those eating GF. While experts agree that safety concerns should not deter anyone from trying their hand at cooking, they say there are some things to take into account to avoid cross-contamination, especially when only certain members of a household have gluten sensitivities. In general, labeling is a must to keep things straight in the kitchen. “Be sure to clearly label all foods and keep doubles of foods like peanut butter [and other spreads] because a dip with a crumb-covered knife can contaminate a jar,” says Lisa Lewis, PhD, author of Special Diets for Special Kids. Brown suggests households buy just one GF version of stocks, broths, salad dressings, soy sauce, and other cooking staples that often contain gluten. The taste difference, she says, is often negligible and is not worth the risk of cross-contamination that comes from having two of everything. Lewis recommends using a toaster oven instead of a toaster, which can collect crumbs more easily, and dedicating hard-to-clean appliances (eg, a waffle iron) to preparing only GF foods to further lessen the chance of cross-contamination. When diagnosed with celiac disease, patients must bypass the most widely available and well-known whole grains—namely wheat in the form of wheat berries, wheat bran, and bulgur—and instead turn to less familiar varieties. Supermarkets do offer these alternative choices, but many restaurants do not. But how can you help clients get started with alternative grains they can barely pronounce, let alone cook? Tricia Thompson, MS, RD, the “Gluten-Free Dietitian” and author of The Gluten-Free Nutrition Guide and The Complete Idiot’s Guide to Gluten-Free Eating, suggests telling clients to be undeterred and get experimental. “Purchase a variety of whole grains. Look at the size and shape. Cook them up as you would rice. Observe how much water the various grains and seeds absorb. Really taste them and think about the other flavors that would go well with them,” she says. Nicole Hunn, author of Gluten-Free on a Shoestring, uses whole grain brown rice or wild rice instead of white rice and suggests trying dried brown rice pasta (which she says is widely available today) over corn pasta. If clients return your alternative grain recommendations with a suspicious glare, simply refer them to the back of a product’s box for cooking instructions. “To start, I would use the manufacturer’s directions on the back of the packaging,” says Brown, explaining that while cooking alternative grains requires a different water-to-grain ratio, there aren’t many other differences in preparation, and the instructions for preparation are always listed on the back of the box, as with most rices and pastas. Of note, Brown steers clients with celiac disease away from grocery store bulk bins, which she calls a climate ripe for cross-contamination. In general, “More liquid is the key to cooking anything that has more fiber and is less processed,” says Pamela Giusto-Sorrells, founder of wheat- and gluten-free food line Pamela’s Products. If cooking GF is intimidating, baking without gluten likely seems near impossible to those without the basic techniques. Even so, experts say it may take a little work, but it’s definitely possible with the right tools. What is one tool to recommend to those baking GF? A good GF cookbook. “Baking with gluten-free flours can be very daunting at first. Gluten-free bakers may experience their share of flops. This is where a good gluten-free cookbook comes in handy,” says Thompson. “A willingness to experiment is useful when trying to convert gluten-full recipes to gluten-free recipes. Consumers may find it easier to work with commercial gluten-free mixes in the beginning. Cafferty says, “Once you get the basics,” after experimenting with already-tested recipes, “then you can create your own recipes,” suiting ingredient substitutions and add-ins to individual tastes. Roberts’ tip for baking GF is to mix it up: “The trick is to mix whole grains for nutrition, taste, and character with starches to lighten and add chew and texture.” For cakes, cookies, muffins, and pie crusts, she mixes brown rice flour with potato starch and tapioca starch for an all-purpose flour mix. For bread flour mixes, she suggests using millet and sorghum with potato starch, tapioca starch, and cornstarch. “I also use a little teff flour or ground oats in my multigrain breads,” she says. Giusto-Sorrells’ trick to creating a lighter texture lies in baking in small portions. “I think that making smaller portions helps with many gluten-free recipes—many cupcakes instead of a sheet cake, small pancakes instead of large, oversized ones,” she says, also recommending consumers with celiac disease try out a bread maker for fast and easy at-home bread. Lewis says most bean flours, mixed with GF grains, work well for baked goods and breads. While these flours add protein to a food’s nutritional profile, beware of using too high a proportion, which can result in an overwhelming taste. “I like to use two parts grain flour to one part bean flour,” says Lewis. Shelley Case, RD, a nutrition expert on celiac disease and the GF diet who authored Gluten-Free Diet: A Comprehensive Resource Guide, recommends yellow pea and bean flours as healthful GF baking options. “Yellow pea flour has a more neutral flavor than bean flours, so you can use a larger percentage of this flour in the recipe, whereas bean flours have a stronger flavor and need to be used in smaller portions so that it does not overpower the baked good.” Because yellow pea flour is not widely available yet, Case sends clients to www.amazon.com or www.bestcookingpulses.com to purchase it. For a more pronounced flavor, Giusto-Sorrells uses GF chicken broth as her all-around flavor amplifier: cooking vegetables in it, adding it to sauces, and whipping it into potatoes. She also utilizes her freezer to make meals in a pinch. “I have cooked brown rice in my freezer at all times, so I don’t have to wait an hour for it to cook.” Several experts also recommend freezing GF baked goods to extend their shelf life. Case looks to legumes to add some nutritional pizzazz to a number of GF dishes. Along with Pulse Canada and Fenster, she came up with a GF guide for cooking with legumes, Pulses and the Gluten-Free Diet, available free of charge at www.pulsecanada.com. In the guide, Case recommends mashing cooked white beans and mixing them into chicken, egg, or tuna salad for extra protein and fiber and a creamy consistency and mixing rinsed canned black beans into a GF salsa for a quick snack. For baking purposes, Case and Fenster suggest puréeing canned lentils or beans in a food processor with a bit of hot water and then adding to any baked recipe for an unparalleled moistness. No one learns to cook overnight, and people with gluten intolerance or sensitivity will likely have some kitchen disasters along the way to culinary accomplishment. But Broihier says success lies in clients’ outlook about cooking and celiac disease in general. 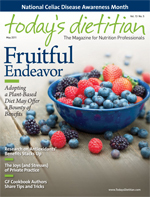 — Juliann Schaeffer is an associate editor at Great Valley Publishing Company and regular contributor to Today’s Dietitian. Place a rack in middle of oven. Preheat oven to 350˚F. Line a 10- X 15-inch baking sheet (not nonstick) with parchment paper. Wash kale and trim stems from each piece. Spin dry in a salad spinner and blot any remaining moisture with paper towels. In large bowl, toss kale with olive oil until thoroughly coated. You may need to use your hands to get every piece thoroughly coated. Toss with salt. Spread in a single layer on baking sheet. Bake until chips are crispy, about 15 minutes. Watch carefully so they don’t burn. Cool pan on a wire rack until chips are cool. Serve immediately. Leave skin on potatoes, quarter, and place in large pot and cover with water. Set over high heat and bring to a boil. Boil 10 minutes, or until potatoes are tender. Drain. Arrange potatoes on a platter with tuna, asparagus, radishes, olives, and onion. In small bowl, whisk together vinegar, parsley, and oil. Drizzle over salad. Season with salt and pepper. Place rack in middle of oven. Preheat oven to 350˚F (180˚C). Generously grease standard 12-cup muffin pan or line with paper liners. In medium mixing bowl, whisk together flour blend, baking soda, ginger, cinnamon, cloves, xanthan gum, and salt until well blended. Add lentil purée, eggs, brown sugar, oil, molasses, vanilla, and vinegar and beat with an electric mixer on low speed until blended. Divide batter evenly in muffin pan. Bake until toothpick inserted into center of cupcakes comes out clean, about 20 to 25 minutes. Cool cupcakes in pan 10 minutes on wire rack. Remove from pan and cool completely on wire rack. *Note: To make brown rice flour blend, combine 11/2 cups brown rice flour, 11/2 cups potato starch, and 1 cup tapioca flour (also called tapioca starch). To make lentil purée, visit Pulse Canada and refer to the instructions on page 16.